Call it a grand opening. 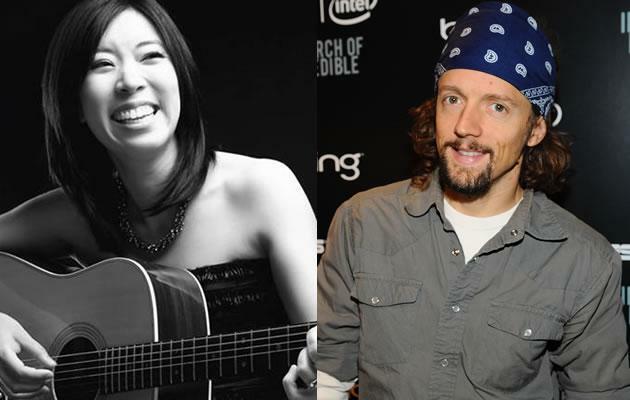 Popular American singer-songwriter Jason Mraz and local songstress Corrinne May are set to perform at the official opening of Gardens by the Bay, the new multi-billion-dollar tourist attraction at Marina Bay. The 34-year-old Mraz, known for his radio friendly chart-toppers such as "Lucky", "I'm Yours" and his latest hit "I Won't Give Up", will be stopping over in Singapore as part of a brand new world tour to promote his latest album "Love is a Four Letter Word". He will be taking centrestage on 29 June at The Meadow, Gardens by the Bay. He last performed in Singapore in 2009 at the Indoor Stadium. Local songbird May, who is back with an album after a four-year hiatus, will headline the concert the next day. She will likely to be debuting fresh numbers from her newest album "Crooked Lines", which was released last month. Local fans of Mraz expressed their excitement at the American returning to Singapore after three years. Atika Ramli, a multimedia designer said: "I was hoping for him to come to Singapore again as I didn't get to attend his previous gig here and I'm really looking forward to it this time!" "I'll sing, dance and steal my way to the Jason Mraz concert!" exclaimed 23-year-old Izyan Arrifin who has been a Mraz fan for eight years. Tickets to Jason Mraz's concert will be priced at S$98 while Corrinne May's tickets will be priced at $38. The tickets will go on sale from 20 April at www.sistic.com.sg.